Tom Thumb and Tradition…for you Mom | All of This! Happy New Year to all.. Personally, I am pleased 2014 has come to an end. Don’t get me wrong, it wasn’t all bad, it just wasn’t all good either. So, to begin this new year of 2015, I have decided to take no chances! 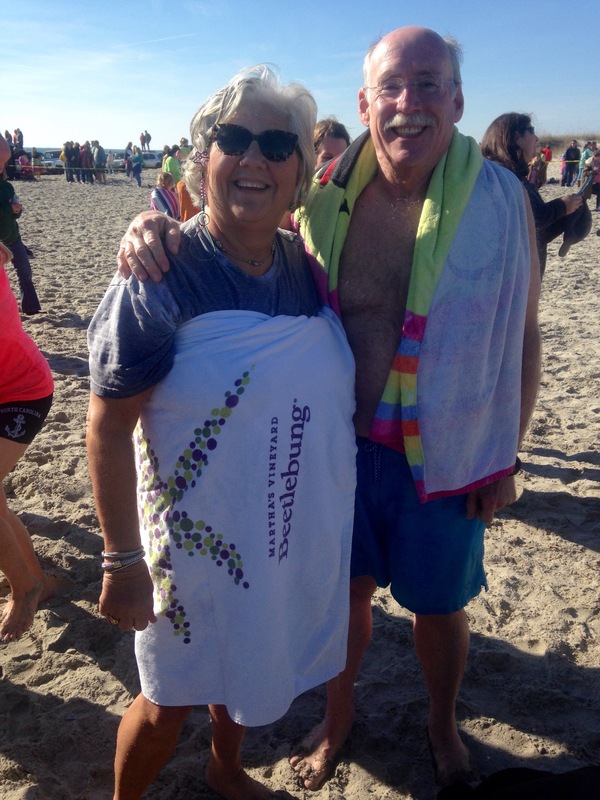 Paul and I plunged into the great Atlantic Ocean this afternoon with several hundred others at the great Penguin Plunge in Atlantic Beach. As I have learned being a Martha’s Vineyard Polar Bear, the cold water is quite restorative. So, we cleansed off the old and are ready for the new. That accomplished, I returned home to prepare a traditional Southern New Year’s fare. However, this year, I am truly returning to my eastern North Carolina roots. Growing up, my Mom always cooked a Tom Thumb on New Years Day. I decided to gift her with that this year. I can’t recall my friends ever eating Tom Thumb. If they did, they weren’t fessing up…just look at the beast! It proudly ladened our table every year. Tom Thumb, for those of you not knowledgeable on eastern NC food, is ground pork, laced with several spices and stuffed into the pig’s large intestine. 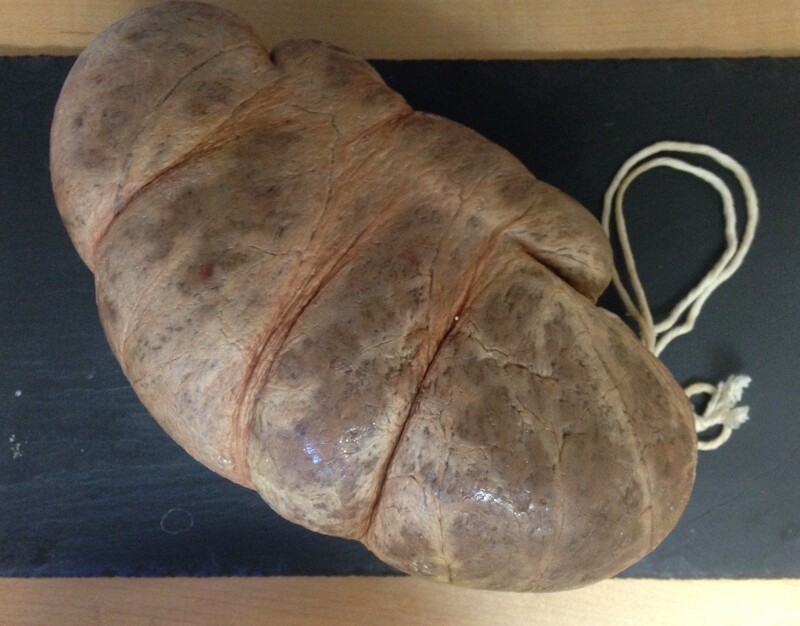 It is wrapped with twine and hung to smoke or air dry. In southern Virginia ( I didn’t know this delicacy crossed state lines) it is called Dan Doodle. I’m assuming these funny names are a result of enticing folks to eat this monstrosity of a sausage. In keeping with tradition, we are also enjoying sweet potatoes, collards and,of course, black eye peas. I did a new twist on the potatoes and black eye peas this year just to kick it up a notch. The finishing touch is fried corn bread. I am pleased to say everything on our table is produced on farms in eastern NC. I know you are waiting with baited breath for the Tom Thumb recipe. Here it is…boil it! Yep, that’s it, just place it in a pot and boil till done. I confess, after it’s boiled, I do slice it and pan fry it just like you would any sausage. I dare you to try it. You may start your own New Year tradition. Preheat oven to 350 degrees. Pierce the potatoes in several places and arrange them on the oven rack in a single layer. Place a sheet of foil on the rack below to catch the drippings. Roast until tender, about 40 minutes. You can make this dish up to one day ahead. Cool, cover and refrigerate. Reheat them in the oven, covered, but increase the time to about 30 minutes. This entry was posted in Just for Fun!, Pork, Side Bar by donnabgetty. Bookmark the permalink.